First impressions matter. The Assimilated Cuban’s Guide to Quantum Santeria; the clever and provocative title of Carlos Hernandez’s debut collection of short stories has all the right hooks for a reader of speculative fiction seeking to read fiction from far and beyond. “Assimilated,” “Cuban,” “Quantum,” and “Santeria”—these are loaded terms, current and powerful; Hernandez had me before I had even opened the book, for many good reasons. First, there aren’t enough science fiction and fantasy writers who, in the words of Strange Horizons’ former fiction editor Julia Rios, “[bring] us a rich tapestry of Latino experience.” Second, Hernandez’s Guide truly is a remarkable debut. “There’s something for the reader beyond dazzling science and the enigmatic, beyond the clarity of the writing,” Jeffrey Ford writes in his radiant introduction (p. 15). Third, the Guide seems to cover a new territory, of culture or of being, that international readers don’t get to see often. Rosarium, Hernandez's publishers, couldn’t have chosen a more opportune moment for this release. As a global community of readers and writers, we are opening up and assimilating new voices and places that have remained long hidden and unexplored. 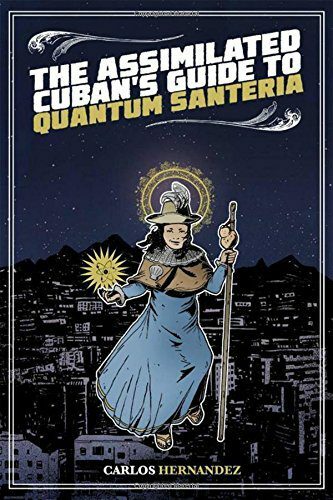 I read The Assimilated Cuban’s Guide to Quantum Santeria during a recent sojourn in Kathmandu; in between scores of fiction manuscripts from the dominant centers of SF reading, writing, and publishing. And I agree with Mike Allen’s assessment of the collection, included among the blurbs—the Guide is “an intoxicating breath of fresh air.” As with Junot Díaz’s Drown—a direct inspiration for one of the stories in the Guide—there is no excess fat here. You open a page, Hernandez’s characters pull you in immediately with their self-assured and friendly voices. And then, before you know it, the stories are over, leaving you both quite satisfied, and desiring more. Stories from Latin American authors often echo my own South Asian experience. The private and public domains of religion, faith, and fantasy; the traumatic experiences of war, migration, and exile; the daily struggles to survive ruthless leaders and warlords, and corrupt government officials—these are concerns of people living in large parts of the world outside of Latin America, particularly in Asia and Africa. Junot Díaz’s The Brief Wondrous Life of Oscar Wao is a brilliant work of fiction that seemed to capture my boyhood experiences of growing up in a war-torn country with its violent and desperate need to exert machismo. While reading Hernandez’s Guide, I struggled to read past my expectations set by his predecessors and contemporaries including Jorge Louis Borges and Díaz himself, but on many occasions, failed to do so. This telephoto, bird’s-eye view comes from the immigrant’s forced habit of looking homeward from a great distance; often through the air passenger’s windows and satellite photographs. The narrator’s despair in “More Than Pigs and Rosaries Can Give” stems from his personal history: his mother was executed on Che’s order. This is not a vacation. He is here to meet a historian who offers to help “suckers—sorry … Americans” like him to “find where their loved ones had been executed by the Cuban Revolution and recovers the soul for them” (p. 142). More than half of the time Hernandez’s characters are trying to impress us with their amiably dashing personalities, but they can also be utterly plain and deeply moving. Among the dozen stories here, “The Magical Properties of Unicorn Ivory” is my favorite. As a purely speculative story that doesn’t require one to be constantly preoccupied with issues of diversity or representation in speculative fiction, “The Magical Properties of Unicorn Ivory” works beautifully (and thoroughly deserves its place in Rich Horton’s The Year’s Best Science Fiction & Fantasy, 2017). In an amusing interview at Angela Slatter’s website, Hernandez says that he hates how animals are slaughtered for ivory, and doesn’t always think it’s wrong to lie to children. It’s worth finding out how Hernandez takes this simple, slightly clichéd, but good-natured idea and turns it into a mischievous, tragic, delightful tale. The Guide contains stories about love, separation and betrayal across many bodies and worlds: “Homeostasis,” “Entanglements,” “Bone of My Bone,” and “Fantaisie-Impromptu No.4 in C#min, Op.66.” “The Macrobe Conservation Project” and “The International Studbook of the Giant Panda” feature spaceships and robots while the protagonists try to save endangered species on Earth and an alien planet from total extinction. There is sharp political commentary in “More Than Pigs and Rosaries Can Give” and “American Moat.” “Los Simpáticos” is a murder mystery worthy of a television series, perhaps starring Miguel Gomez from The Strain as the hitman! This brings me back to Díaz, and his tireless efforts to appear candid and amiable. In a conversation with Karen Russell at the New Yorker Festival, Díaz suggests that a book nerd is the last thing a boy would aspire to be growing up in Dominican circles. As a professional storyteller, Carlos Hernandez clearly knows what is at stake for him as a Latin American author. Although original and proficient, the range of his style within this collection appears to be uniform. Díaz followed Drown with a masterful novel, and after reading The Assimilated Cuban’s Guide to Quantum Santeria, I strongly suspect that Hernandez would probably perform better at longer length. The Guide is a strong and polished debut, no doubt; one that has clearly left this reader wanting more.